The nicer and slightly kinder winter weather brought big crowds out last weekend at the 37th annual NARI Home Improvement Show. 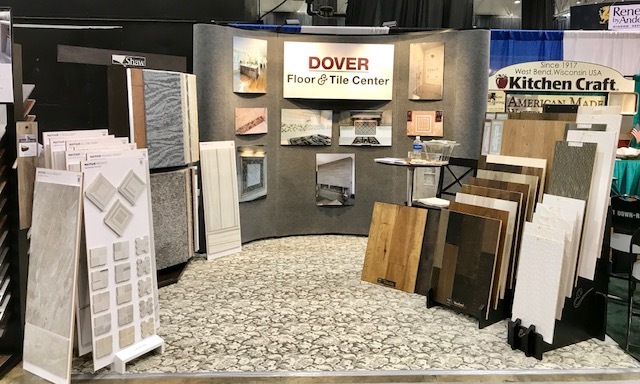 And for our team at Dover, the double-the-exposure opportunity was a hit with those Show attendees: For the first time ever, we had two booths…one for Dover Home Remodelers and one for the new Dover Floor and Tile Center. This proved to be the ideal venue to promote our new floor and tile retail store, while also gaining greater brand reach for Dover Home Remodelers. Clearly, we were able to cast a larger net with two booths: It created opportunities to cross-sell our flooring/tile expertise alongside our trusted remodeling experience. The two really do go hand in hand and will continue to provide more options and resources for our customers moving forward. People come to this NARI show because it really is the best place to gather design ideas and get firsthand inspiration and instruction for their home improvement projects. The people who our design team talked with were really excited about their ideas. We met lots of potential new clients and are now busy scheduling and meeting with them to get those projects rolling. We’ve also had more foot traffic at the tile center, which is really great to see. Thanks so much to those who dropped by—we look forward to working with you to help bring your home remodeling visions to reality.